As a collector and avid reader of old books, I was bound to end up with editions of at least a couple of Williams’ novels in my collection. I picked up The Strange Woman at a used bookstore in northern Michigan in the fall of 2014 (a 1942 hardcover); Leave Her to Heaven was acquired closer to home, at my favorite local antique shop (a 1944 hardcover, with very thin pages due to paper rationing). My list of “to be read” books on my own shelves is quite long — not to mention, I have library/Overdrive addiction which keeps me busy in my free time. As such, it took me a while to get around to reading either of the Williams novels that I own. When I finally read Leave Her to Heaven a few months ago, I enjoyed it greatly and was quick to read The Strange Woman a few weeks afterward. Both of these were stories I was familiar with, having first seen the Gene Tierney and Hedy Lamarr film versions years ago. 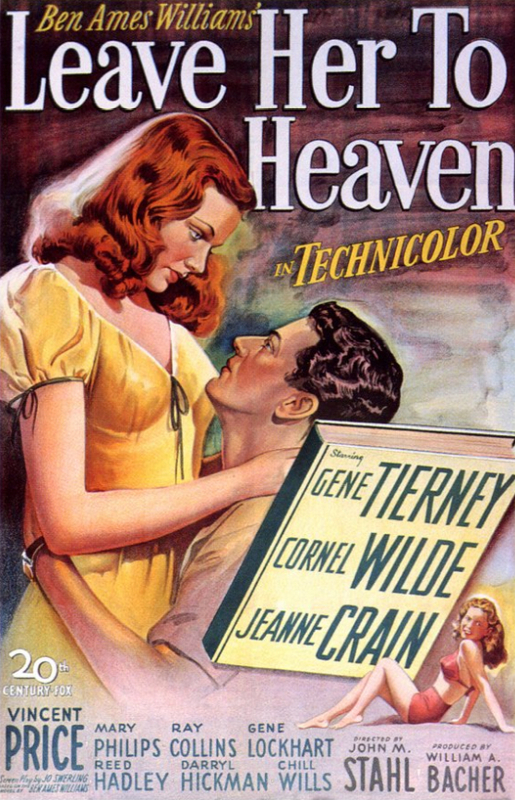 Reading Leave Her to Heaven was like watching the film for the first time. It’s a novel packed with twists and surprises, a crazy read from start to finish. It never loosens its grasp on the reader, just as the film never loosens its grasp on the viewer. While reading, I could picture no actress but Gene Tierney in the role of ruthless, manipulative Ellen; she truly was perfectly cast and carries the role better than anyone else could! Though every bit as calculated and obsessive as the Ellen of the novel, Tierney puts the viewer under her spell. 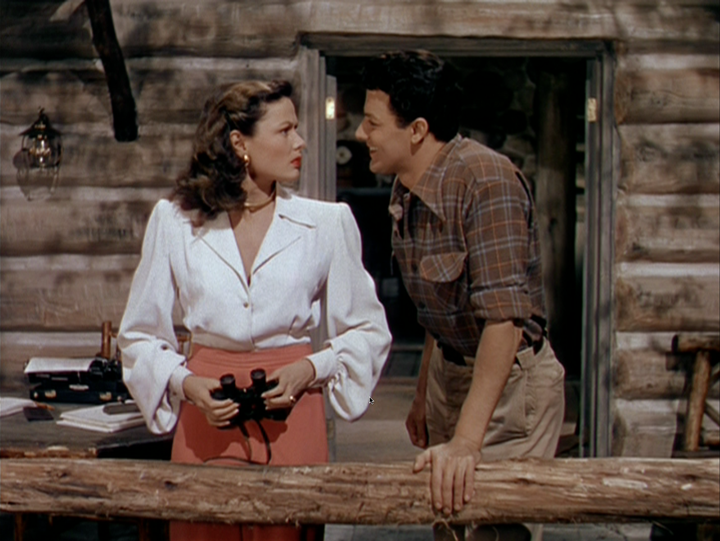 Jo Swerling wrote the screenplay for the film adaptation of Leave Her to Heaven, and it’s a very nicely-executed transition from page to screen. Swerling captures all of the novel’s suspense and surprises. Some plot points, of course, are removed or made less time-consuming, as is always bound to occur when a novel is adapted, but the spirit of Ames’ novel is captured well. Visually, it’s an incredibly stylish adaptation, which has contributed greatly to the film’s longevity as a beloved classic. I couldn’t even begin to count the number of times I’ve seen stills and GIFs from this film on Tumblr. The elegant costume design, rustic-but-glamorous setting and saturated color palette have captured the wide-eyed gazes of classic film fans both young and old. The Strange Woman is an interesting read as well, though quite different from the film. Told through the perspectives of seven men, Williams writes the tale of Jenny Hager. As a young girl, Jenny has a strange charm about her. As a woman, she is charming but heartless, a result of being abandoned by her mother and growing up under the care of an abusive father. Williams’ novel is unsettling to read, for we never read the perspective of Jenny herself — only the perspectives of the predatory and perverted men she knows throughout her life. While the film follows the same general sequence of events as the novel, some of the plot points are glossed over (such as the story of Jenny’s mom), and Jenny’s own perspective is given more attention, though her mentality is not deeply explored. The result is, oddly, a simplification of the character and her story, despite the fact that Ben Ames Williams technically gives her less of a voice by not writing her direct perspective. The film focuses on the character as an evil-at-heart woman who uses her beauty and charm to manipulate others, driven by a thirst for wealth. In an early scene, young Jenny displays an acute awareness of herself and of the world, telling her father that she’ll have everything she wants when she’s older, because she’ll be beautiful. With her age in the single digits, she’s already begun plotting to increase her station in life. An edge of noir is brought to 19th-century Maine by director Edgar G. Ulmer, and Jenny is the femme fatale. The novel, on the other hand, does a better job of explaining why Jenny acts the way she does; it’s very clear that she’s been made “evil” by the way that she’s been treated throughout her life. 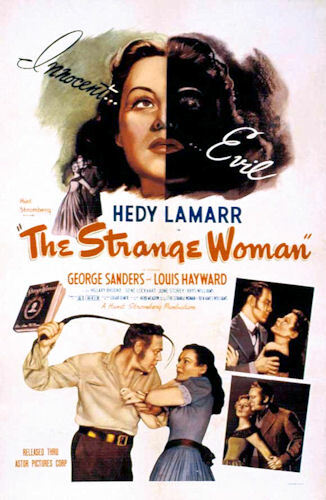 Leave Her to Heaven and The Strange Woman are both fascinating stories, whether read or watched. If you’re a fan of either film, I highly recommend tracking down the source material. Both novels are incredibly engrossing and are, in some ways, even darker than their film counterparts. The work of Ben Ames Williams almost seems tailor-made for Hollywood — the perfect foundation for captivating, stylish psychological dramas.